All of your points are good and valid. I know that I have makeup that is many times older than the times you note but I am reluctant to toss it out until I have an adequate replacement. I do hope one day to be able to get a professional or semi-pro make over. I really like the idea of doing it in a department store. My department store make over was the best thing I could have done for myself. I have saved so much money on spending it on the items I purchased at those times. Also, on tossing makeup, I totally get you, but the one item you really should ditch after 3 months, if not sooner, is mascara. It is the one item that probably gets the germiest and needs to be the cleanest. Oh BTW Pat- You were the 100th comment on my blog! Fitting that it should be you! Thanks! It is nice to be #100. I will try to get over my basic cheapness and do a major makeup purge. 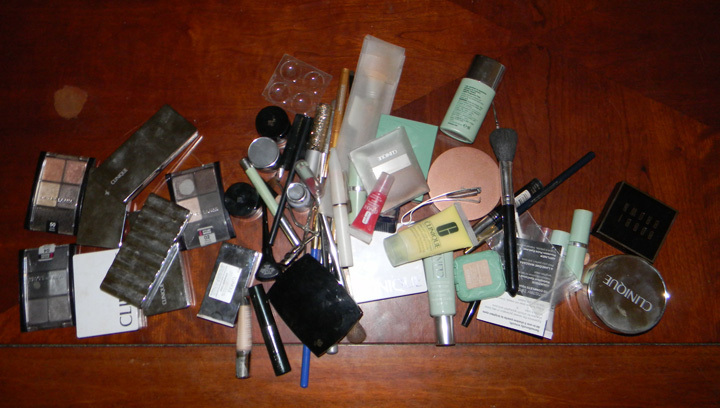 I do not get out and about all that often to actually use up too many cosmetics so I have makeup that goes back years. Jules and I spoke yesterday about how hard it is for either of us to throw away what appears to be perfectly good and usable makeup. I mentioned that tends to be even more difficult for me as I only occasionally get to wear my makeup relative to the time I own it. Some of my makeup items are way past their due dates. But certain ones I try to be vigilant about, like mascara. Jules mentioned to me that she thought it might be a good idea to try and use one use mascara brushes. That would help the mascara stay fresher longer. Wet makeup is of bigger concern, and the biggest concern is, do you touch your face with the applicator and then put it back into the makeup. That is a great way to transfer all sorts of nasties. Thanks for the advice. I have been making plans for a special costume this year and am seriously considering jumping the hurdle and getting professional advice. Oh I hope you do jump that hurdle. It has made me enjoy my makeup experience SO much more! Go for it!